The Raleigh Chopper brought the style of Easy Rider to the backstreets of Britain in the 1970s. It took the UK youth bike market by storm and saved Raleigh from financial disaster. The Chopper was a different bike for young people and it was a first choice as a Christmas present, but experts had safety concerns. The 1980s' BMX craze that finally killed it off. 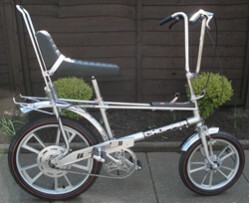 The design of the Chopper was revolutionary when Raleigh launched it in the UK in 1969, but the ape-hanger handle bars and long padded saddle were already familiar to American children. 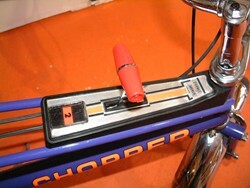 The original inspiration for the Chopper was the Chopper motorcycle. It was a cut down and customised machine. Chopper motorbikes had a cult following with enthusiasts in the US from the late 1940s. US manufacturer, Schwinn, made bikes with ape hanger handle bars in the early sixties. But they were nowhere near as well packaged as the Chopper. In the US market the Chopper was more evolution than revolution. In the UK market it was something new. The movie Easy Rider premiered in 1969. In the film, Peter Fonda and Denis Hopper cruise around America on stripped down Chopper motorbikes. This meant the Raleigh Chopper had instant cool. In 1971 Raleigh saw a 55% increase in cycle sales due to the Chopper. The cycle maker went through lean times in the 1950s and 1960s as sales of adult bikes slumped. With rising affluence, more people bought cars, motorbikes and scooters. The traditional push bike had a down market image. Raleigh charged a premium for the Chopper over the price of a conventional child's bike. In 1970 it cost £34 19s (£360 in today's money). 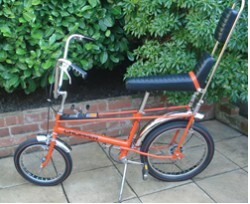 The Chopper was so popular in 1970 that retailers had to persuade adults it was not a suitable bike for them. It gave the kids something different from an adult bike, something of their own. 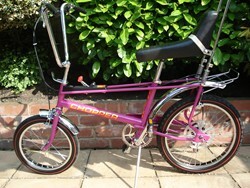 The Raleigh Chopper brought the style of Easy Rider to UK streets and to boys in the ten to fourteen age group. 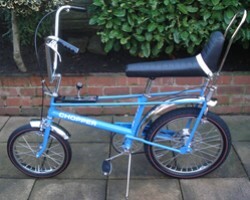 The Chopper was joined in 1972 by a bike for younger children, the Tomahawk. But by then the safety record of the Chopper was being questioned. An Italian competitor, the Morando Easy Rider Bike, was withdrawn from sale due to safety concerns. Its UK distributors, the Barclay Group (Mobo, Chad Valley and Tri-ang), recalled models already sold. A British Medical Journal report claimed that the high handle bars made steering unsafe. Others claimed that it was possible for two children to ride on one Chopper. Safety concerns prompted a revision to the basic design in 1972, with the Chopper Mk 2 having a shorter seat. Raleigh also made changes to the gear leaver style and handle bars. Raleigh had to defend the safety of the Chopper when questions were raised in Parliament. The Chopper was a bike that put style before practicality. In the early years of the 1970s it might have been every boy's dream, but volunteers for a Which? report in 1972 found the Chopper slow and hard work. Most would have preferred a racing bike. In spite of the style over substance approach, the Chopper won a place in the Council of Industrial Design (COID)'s Design Index. It fell out of favour in the early 1980s, when BMX bikes became the latest craze. Raleigh launched a new model, the Mk3. It had much of the original style, but without the crossbar mounted gear leaver and banana style seat. The Chopper Mk 1 is worth a little more than the Mk2. The Mk1 is rare and more desirable. If you want a good, usable Chopper, look for a Mk2 in presentable, but not perfect condition. You should be able to find one for around £400. Perfect examples of both models are worth more than double this price. In the USA, Raleigh sold the Chopper as a 5 speed or 10 speed bike, as well as the standard Sturmey Archer 3 speed. The 10 speed is the most highly prized of all Raleigh Choppers. If you want one today, a perfect example will cost in the region of £2000. The GT Sprint was a Chopper with drop handle bars. It was available in two colours: flamboyant green (left) or fire bronze. The Sprint had different tyres, a 'racing saddle' and a modified frame, but only 3 speeds. It was not a big seller and thus is a rarity today. Of course that makes the Sprint all the more desirable and a top notch one will now cost from around £1000 to £1500. The Raleigh Chopper 5 speed had a new gear change based on the classic racing bike derailleur, but with the Chopper style gear shift. Strangely, it was only available in pink, a colour guaranteed not to appeal to boys in the 1970s. So like the Sprint, it did not sell well and was quietly dropped in 1976. It is, of course, highly collectable today. Expect to pay around £1000 for a good one. To celebrate HM Queen Elizabeth II's Silver Jubilee, Raleigh released this silver special edition chopper. It was actually launched in 1976 to be in the shops in time for Christmas. In spite of the new wheels (yes, those alloy wheels are genuine) it was not a great seller and is also a rare bike today. You will need to spend around £1500 for one of these. Who designed the Raleigh Chopper? Whilst the Raleigh Chopper caused controversy in its day for its safety reputation, today a controversy rages over who the actual designer was. Both Raleigh's Chief Designer, Alan Oakley, who sadly passed away in 2012 and Ogle's former Managing Director, Tom Karen, have claimed to be the Chopper's designer. Alan Oakley always maintained he sketched out the design for the Chopper on a flight back from the USA in 1967 after researching into the American teenage market. Ogle was approached by Raleigh in 1968, to help them come up with a design to rival the Schwinn bike that was better than their first attempt, the Raleigh Rodeo. Tom Karen recently showed his original sketches, which look remarkably like the final design, to the Daily Mail in May 2014 after fishing them out of his garage. Both Wikipedia and the enthusiast website raleighchopper.info say it was Alan Oakley; you will need to make up your own mind. More than likely both men contributed to the final design. 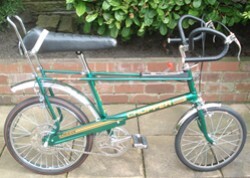 The most comprehensive web site about the Raleigh Chopper is www.raleighchopper.info. See also, the Raleigh Chopper Owners' Club and Raleigh Chopper on Wikipedia. "I had a Chopper bike. I used it from the age of ten to fourteen. It was fantastic, red colour, the ease of lowrider seat. The banana seat was very comfortable and the gear position was attractive. "I'm looking for a mk2 to restore for a special project.I don't care what condition it's in as it's going to be totally restored for a temporary shop display. The rustier and cheaper the better,I'm in Southampton but will pick it up or arrange couriers wherever you are. "Hi, Im in the process of buying a mk3 chopper, it's in very good condition. but has the front mudguard missing. I haven't been able to find a mk3 mudguard anywhere, will a mk2 mudguard fit onto it? Also would I be able to fit lights from the mk1 and the raleigh origianl badge from an mk1 to my mk3? Rough restoration projects are selling on eBay for Â£100+. It depends a lot on condition of course. Mint examples sell for Â£500+. "As a kid I recall someone on my estate having a Panther which was Black and like a Chopper, I remember it clearly because it was almost identical to my own Chopper-type bike called a Malborough Bronco. I've since found out was also known as a Vindec High Riser according to this place...Pic is exactly my old bike, same colour etc. "I am about to restore a Raleigh chopper mk2 and looking for wheels. Do you know from where I can get either a pair or the front?? I am new into this and searching for websites or forums that can help me build it. Can anyone tell me if a mk1 headstem will fit a mk2 handle bar. It is going to be worth around Â£1000. Unused with tags would be, in my view better than restored, even if the restored bike looks better. However, blemishes will detract from the value unless they are minor. I hope this helps. As with all valuations it is difficult to be more than approximate. If you are after insurance value I would probably put it at Â£1500. I have an original chopper that I am looking to sell. I was handed it down by my dad and I'm not even sure if it's an MK1 or 2. How can I tell the difference so it know what price to advertise it as? I have a Mk1 complete which needs restoration. Needs re-chroming and re-paint. I have new tyres and spokes for it. "My sister has a Raleigh Special Edition Chopper bike it does need restoring just looking about how she would sell this on and where is the best place to do this. It is the Silver Jubilee Special Edition 1976-1977. "I have an original Raleigh Chipper, never used in yellow. "How do you get the gear lever off a 3 speed mk2 chopper [the actual chrome lever itself]. "Hi I am selling a blue MK3 Chopper. It will need a new rear tire if you wanted to ride it as the steel cord has broken through on side wall apart from that it is in very good condition. I have a chopper me 3 all chrome and pristine condition. "Hi, I'm selling my fully restored MK2 1977 space blue chopper. It's in mint condition, kept indoors and only taken out on fair weather days. Includes mirrors and squirrel tail on a chrome bar.